I felt myself getting more and more excited about this book as the release date drew closer. I've enjoyed the Twilight books and I'm looking forward to their conclusion in Breaking Dawn, but I found myself pretty intrigued to see what Stephenie Meyer would do when she set out to do something different. Plus, I was just in the mood for some science fiction. I've loved sci fi ever since I picked up my first Ray Bradbury and, even though Meyer states it's science fiction for people who don't read science fiction, it certainly qualifies. What with the aliens and all. And there ended up being more (and a wider variety) of them than I was expecting. You're undoubtedly familiar with the premise of this novel already, so I'll leave it at this: it's invasion of the body snatchers, but the body snatchers are benevolent and the humans are, well, human. Flawed, emotional, corruptible. You name it. And there are very few of them left at all. But the few there are are....tenacious. Especially Melanie, the human whose body has just been taken over by the soul called Wanderer. Known for her extreme skill at taking over a body, as well as her penchant for never staying on one world for more than one life, Wanderer has been hand-picked for insertion in the rebellious Mel in the hopes that she will be able to glean details from Mel's memory about possible leftover humans in hiding. As you might expect, all does not go smoothly for Wanderer. Or Mel. The great thing about The Host is that the main character is one of the "bad guys." As a result, the reader's emotions (and loyalties) are wonderfully conflicted throughout the beginning of the story. It doesn't take long, though, to fall in love with Wanderer and I really liked the way Meyer interspersed Wanderer's narrative with flashbacks from Mel's life as she hurled them, one after another, at Wanderer's mind in a bid to save herself as well as the ones she loves--her younger brother Jamie and her human love Jared. I was pleasantly surprised to find that, contrary to the whole love story being central to the plot scenario I'd been prepped for, the book was not at all ruled by romance. It is a story about love, but it's more a story about what it means to be human and humane. The love in the story includes all forms: familial, friendship, platonic, and romantic. I was particularly drawn to Wanda's fierce love for Mel's little brother Jamie and the lengths she went to to protect him. The Host is in many ways (despite its length) a small, intensely personal story. I loved it, was sad when it was over, and will reread it again soon. Hey, thanks Tez. Feel free to roam around these parts as well. 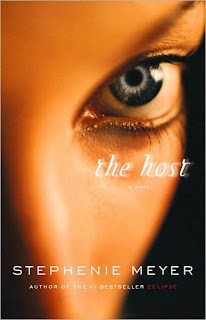 I'm about to start reading The Host one night very soon. (I've been saying tonight for the last few days.... ). I'm really looking forward to it, especially after this review. Hey, Christine. I think you'll really like it. I'm still thinking about the characters and smiling over my favorite parts. I'm excited for the book, too, since your review. thanks! Of course! I thought it was highly entertaining. Wanderer totally rules. I love this review! I completely understand how you feel--and I cannot wait to give this sweet/bittersweet book a reread. She rocks. I just loved her. And Ian. My love for Ian is large. Thanks, Lisa! I will definitely mosey on over to check it out. Such a good book.